The first guest post is from my friend Alison of Wardrobe Oxygen, who is a great blogger and just an awesome person. Thanks to her for this great post! Hi, my name is Alison and I blog over at Wardrobe Oxygen. When G of Tulle & Combat Boots asked me to guest post on Summer, I jumped at the chance. All winter long, I wait for summer. Warmer weather, bright days… and music festivals! 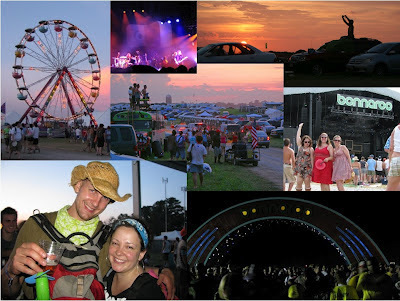 For the past several years I have attended the Bonnaroo Music Festival in Tennessee and it’s the highlight of each summer. For those who haven’t heard of it, Bonnaroo is one of the biggest music festivals in the United States. Around 80,000 people attend to see art, comedy, movies, and over 100 different bands and musical artists across all genres. While some stay in hotels and local yokels may get day passes, the majority of the attendees camp on the festival grounds, otherwise known as The Farm. I am not a camper, yet each year I stay in a tent in the blazing Tennessee heat living without electricity or bathrooms. Over time we have mastered camping – we know to put a silver tarp on the east side of our tent, to bring a poncho and pair of rain boots, and how to make well water from a spigot become a makeshift shower. Each year I say I won’t do it again, but come the next January I’m buying Bonnaroo tickets! Why do I do it? Because there is no similar experience on this earth. I don’t know if it’s the heat, the dirt, or the arepas, but the experience helps complete strangers work together, get along, and enjoy their common interest – a passion for music. One camping neighbor may be there for the Country headliner, another for the Metal band playing Friday night, another is there purely for the Electronica late-night sets; all are there for the love of music. Some of the best shows of my entire life have been at Bonnaroo – I went while pregnant and saw My Morning Jacket in a rainshower and Kanye West play during sunrise. Seeing Galactic late night in 2010 was one of the craziest experiences ever. I got to see the fabulous Beth Ditto and The Gossip and Robyn up close and personal, and am honored to have seen The White Stripes while they were still together. Not only do I find my secret super camper in my soul, but I also find the hidden hippie in my heart. While I spend the workday in pencil skirts and pumps, come Bonnaroo time out comes the floral sundresses, bandannas, and tie dye. Bonnaroo is a place to let the freak flag fly, be it wearing a tutu and rainbow knee socks or a body suit made completely of glo-sticks. One of the best parts of Bonnaroo is the people watching – seeing how they react to the music, and how they choose to dress for the experience. Have you ever been to a summer music festival? What is your favorite part of the experience?